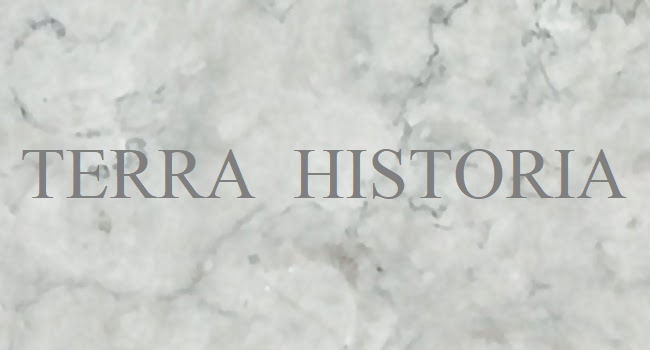 I'm sure that EmperorTigerstar isn't the only one here that makes maps, alternate history or otherwise! So let's see some maps that you guys have made! It's The year of 1078 A.D. House Of The D'Asturias has finally conquered the last spot of Moorish resistence in North Africa. 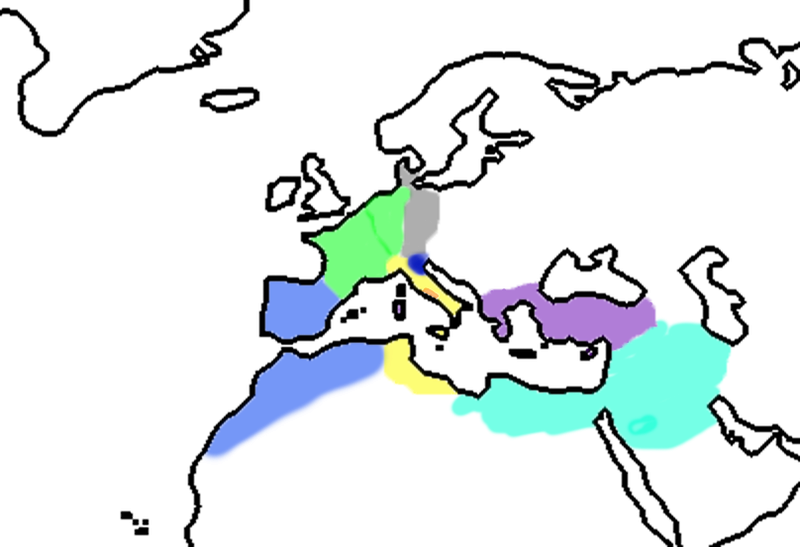 The Portucale Empire Stands Alone in the iberian peninsula. Recent wars wore fought against the Kingdom Of Asturias and France (For The Catalunia region) for the unification. But Now The once spanish tribes, roman tributaries, visegothic kingdoms, now stand under the banner of Alexander III emperor Of Portucale. House D'Asturias have fought the islam rulers since the late 8th century, from the Duchy of Oporto to the Kings of Portucale, and now Emperor of the whole Espania. The Portuguese rise like a fenix from the ashes of the now long gone Roman Empire. The Islands in the mediterrian are still in the control of the ruler of Constantinople, the dukes in Italy are from the same heritage that molded D'asturias in the heart of the dinasty of Italian Lombards, years ago Bacchus, grandfather of Alexander, king of Portugal offered the hand of his daughter to the king of Lombardy, and later married his own son and heir to a daughter of an important noble. Years later, his grandson Inherited and unified both duchies and kingdom of Portugal. With The aid of the Portguese the Lombards were able to conquest Carthage from the hands of the Muslim. And the now unified Italy under the Lombards and the unified Espania under Alexander see a greater evil than islam enemies now defeated, their christian neighbours and evergrowing empires of France and Germanic States. Portugal have now managed some minor victories as the conquest of Barcelona. But the enemies forces were huge a victory was only possible by the aid of the lombards. Once fighting against the infidels, now the allies who control most of the mediterrenian must unite against the warmongering neighbours, before annexing any more territory. I apologize for the quality of the map in advance. It is the year 1453, the muslim invasions of the 630s all failed and the turks didn't manage to break through the persians in the east. The eastern roman empire stood strong in the east and held a firm grip around it's subjects. Constantine XI of the house Palaiologos decided to finally fulfill Justinians dream and reconquer all the roman territory which was lost during the 3rd century. France is broken up into different duchies, while the English are advancing further and further into french lands. The mongols were not able to penetrate the persian defences in the 13th century but still managed to subjugate the russian pricipalities. But now, the house of Rurikovich destroyed the mongol opressors and broke free from their chains. Denmark had, due to the catholics waging crusades against the orthodox romans, enough time to establish an empire in scandinavia. The holy roman empire is one of the only alliances which was able to withstand the roman invaders. I really hope you liked this scenario. Give it some time. Maps take time to make after all. 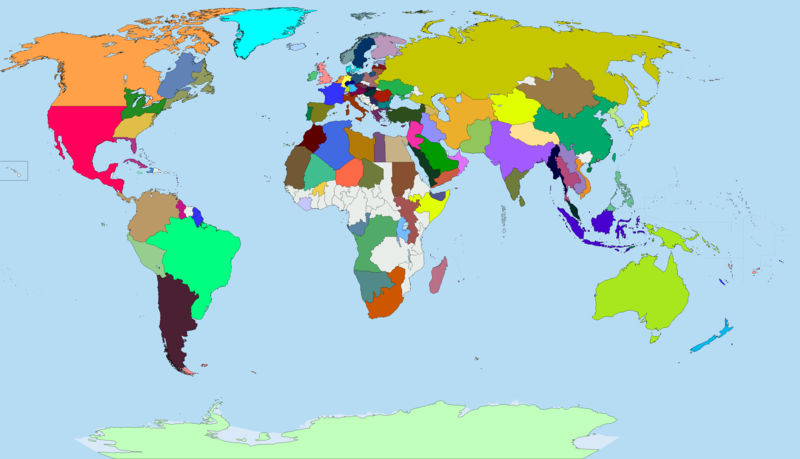 Could someone make me a map of the World where Islam never happened IDK maybe Muhammed fell down a flight of stairs.it'd be interesting to see ! also what template do you use to make maps? Brusilov wrote: I apologize for the quality of the map in advance. I love a good map thread. I'll sticky this thread. England won the battle of Bouvines in 1214 and king Phillip II. died in battle. With no capable king in France, the kingdom fell under English and Spanish rule. Burgundy made a pact with England and betrayed their French overlords right after the battle of Bouvines. Barbarossa managed to unite the Holy Roman Empire in one nation, which then quickly fell apart but not into tiny duchies but rather a half dozen or so bigger ones. Due to Barbarossa uniting the empire in the 12th century, the dominant dynasty is the “von Hohenstaufen” dynasty which pursued a different path than the Habsburgs. Bavaria, now under von Hohenstaufen rule, remembered its times as the stem duchy of Bavaria in the 10th century and reclaimed the lands which formerly were under their control. After that they claimed the title of kingdom. They are now the dominant power in the former empire, since Austria simply doesn’t exist. Brandenburg didn’t rise to power much in Germany. Since the von Hohenzollern dynasty didn’t make it up north from their native lands in Württemberg and Swabia. Venice rose to unthinkable heights and now has many more trading posts and cities than ever before. even conquering their arch nemesis, the republic of Genoa. Their fleet is the most feared one all around the Mediterranean. They even managed to conquer Carthage (Tunis), which they acquired by winning a trade war against the sultanate of Tunesia and the mamluk sultanate. They destroyed nearly the entirety of the combined muslim fleet. The papal state (now a shadow of its former self) managed to grapple onto Rome. Since Barbarossa managed to unite Italy, most of the papal lands fell under imperial rule and later under the rule of the kingdom of Italy. 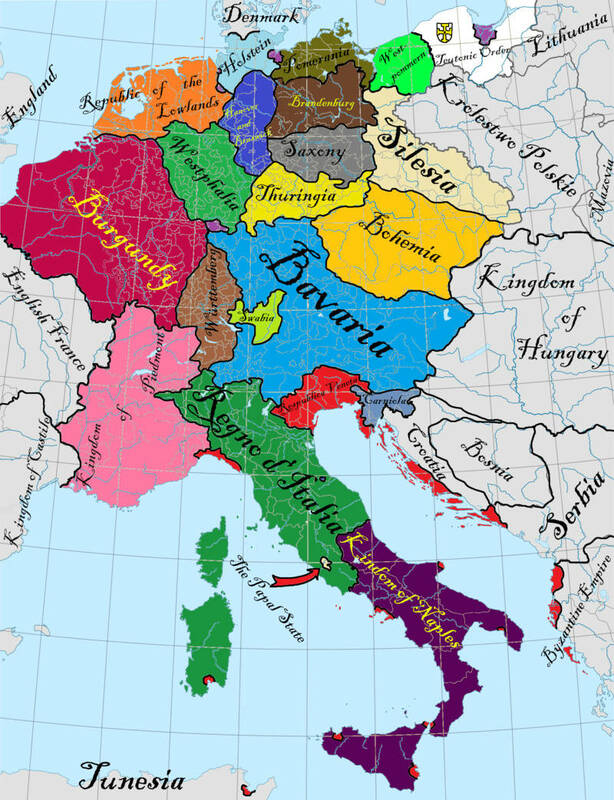 The duchy of Savoy (now known as the Kingdom of Piedmont) got a lot of land from France during the English conquest of French lands. They are a good ally to England alongside Burgundy. The piedmontese reign extended from the Mediterranean up to Switzerland and France. They are a major power and a force to be reckoned with. Hope you liked my scenario, please tell me if I left something out or if you aren't satisfied with something. Cool scenario. With so few duchies, it would be interesting to see if that would be enough to stop the expansion of France (or England in this case) at the expense of the HRE, since in our timeline France was consistently taking territory from it up to the end of the HRE's existence. Mr Trolldemort wrote: Cool scenario. With so few duchies, it would be interesting to see if that would be enough to stop the expansion of France (or England in this case) at the expense of the HRE, since in our timeline France was consistently taking territory from it up to the end of the HRE's existence. In my scenario England has the former imperial duchies of Burgundy and Savoy as his allies. Half of these duchies are also in a loose alliance (Kind of like the HRE), lead by Bavaria, but with no direct authority. Kind of like the EU just less regulated. Kind to think of it, I could expand on the lore of this scenario a bit more. Or I guess you could. 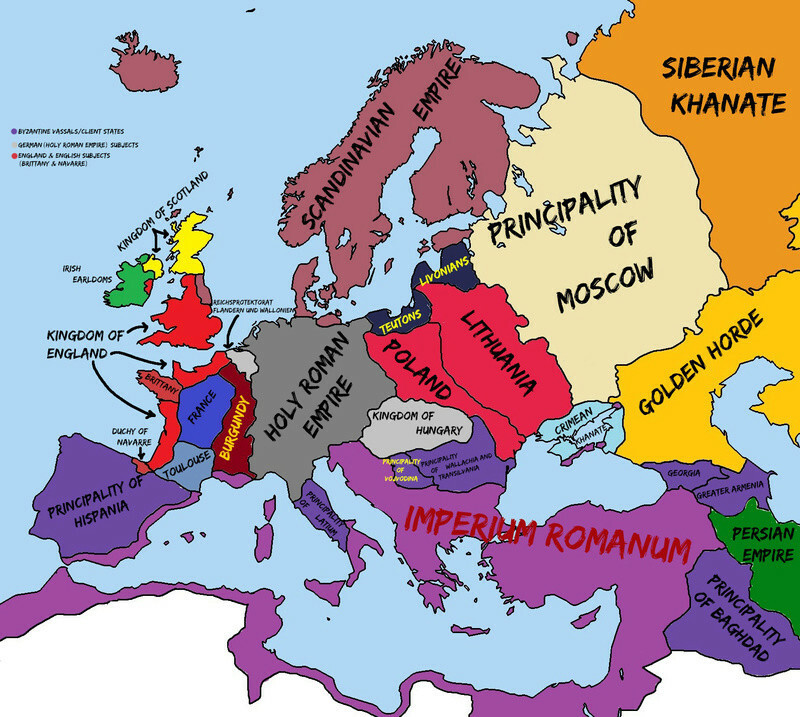 It would be cool to see how Eastern Europe would be like with a more powerful HRE at its borders and no Ottoman Empire in the south. 1300 AD, hmmm. Make it 1500. Let's say Novgorod became the dominant power instead of Moscovy. Mongol hordes are destroyed. If so, consider it done until tomorrow.